Here's your all-awaited Toggle Mod v16.0 for Mini Militia 3.0.27, works with all non-rooted devices with ARM processor architecture. Really sorry for the delay though, had to patch up some major issues. Here you go for an updated version with awesome features. Includes all features from the latest version of Toggle Mod v16.0 - http://www.revealedtricks4u.com/2016/12/toggle-mod-v16.0-mini-militia-v3.0.27.html , which is meant for rooted phones. Install the downloaded "MiniMilitiaMods-RevealedTricks4U.com-NOROOT-v16.0.apk" file. 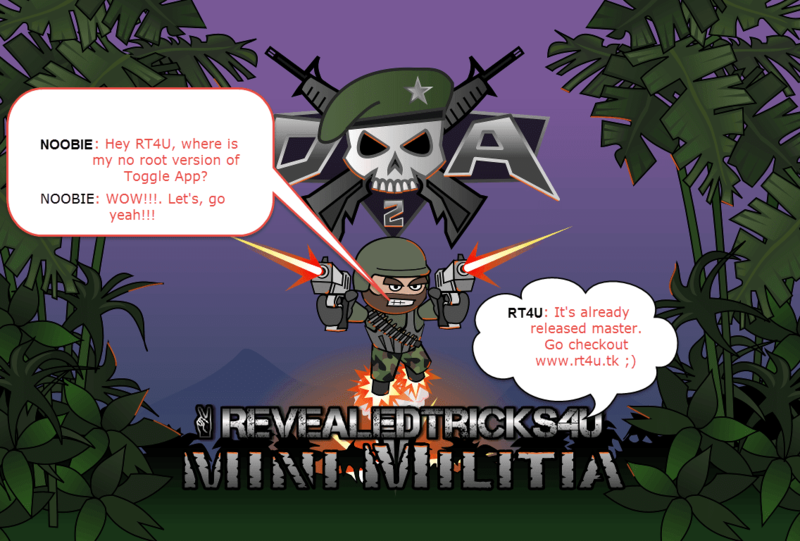 Make sure you have already installed the latest game "Mini Militia - Doodle Army 2". It is version 3.0.27, at the time of writing. That's it. Now press button "Launch Game", back in the app and enjoy the game ;). Will try increasing the bullet range in the next update. Those words really helps me move forward. Thanks for using my applications. Very soon, just stay subscribed. This update has already fixed that issue. Try reinstalling if you're facing the same problem. Will surely add that feature in the next update. Would be cool and helpful. Will think of it in the future updates. You're welcome Fahim. Just don't use the mod so obviously like, showing yourself that you have unlimited ammo by shooting without a stop. Hi Shihab bro plzzz Fix short distance range ammo bug because the ammo we fire are range very short plz fix it. I hop you fix this. I request you to make this feature soon for easy & efficient working for everyone bro. But unlimited flying power is most important thing in mini militia.I hop you will add unlimited flying power feature in your next toggle mod. Hi am facing a problem, i have installed the original game from play store, i patched it with pro pack option, firstly you don't get enough battle points in the game to purchase all the upgrades, second even afyer equipping the upgrades i dont get laser sight for my sinper and bazooka though I get them for the smaller weapons, why is this happening, i didn't face this issue as i was playing the V 2.2.61 earlier the game already had option of no reload and unlimited jet i just patched it with pro pack no reload and unlimited jet it was working fine. You should buy pro packs, if you really think the developers deserve some penny for their hardwork. And am sorry, am no longer supporting or updating the pro pack feature. Hey bro...AMAZING WORK....But in magic health,flying....i can select up to only 5x....Why?? ?/i cant move that line of bar to 6x....Any my mistake or its only up to 5x?OR may my phone not supported to 6x???? Thank you Harshad. Just scroll that seek bar to the extreme right, you'll get that last option. and yes U can add option of self sucide? Hey bro pls do something with shotgun.. Mean when I select bullet per shot 2x at that time it's good with other guns but with shotgun it's hilarious..If u do something with that it will be amazing..
Hi Jack, will surely look onto that. I m your biggest fan . Plz add these features in your next awesome mini militia toggle mod. I use your toggle mod and hack my skill.my skill is 45. But when I won every matches my skill don't increasing and when I losses some matches my skill don't decreasing why? My skill sticks on 45. The question is my skill don't increasing and don't decreasing why? It's such a nice work. It would be nice if you add the feature "Aimbot" in it. When I am playing this hacked game everything is hang every is stopped on one place plez solve this prob man.